Warm greetings from Nepal one and all. Writing this address has become a yearly staple. Since 2015, its content has been heavily diverted towards photos and stories post earthquake. Only this year can I safely say that we, as an organisation are back on track after the devastating events of April and May 2015. Our government schools assistance programme, assisting over 80 schools in 9 of the worst affected districts has been a great success. Projects varied from TLC (Temporary Learning Centre) construction, toilet, septic tank and water projects, furniture assistance and ECD (Early Childhood Development) Centres. This programme has benefitted over 5000 students. An Electric Aid Ireland grant for the rebuilding of Devi Primary School, in Bhirpani, Ramechhap District was obtained in early 2017. The 3-roomed building was completed in July 2017 in co-ordination with the school management committee and District Education Office. Our relocated Teku centre in Kathmandu is in operation for 7 years now, assisting the education of over 60 children from 4 local schools, as well as day classes for 10 children with little or no previous education. The centre is run by Rupa, our teacher, and Menuka, and caters to poor urban families, mostly migrants from rural villages in Kathmandu who work to make ends meet. 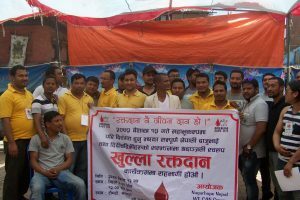 Nagarhope’s 2nd annual Blood Donation Programme on Baisakh 12th (April 25th) co-incided with the 2nd anniversary of the earthquakes that hit central Nepal. Another amazingly successful event saw 164 people donate blood. Our 8th annual women’s picnic was held, as ever, on 8th March (International Women’s Day). This year over 110 women from 3 different villages in Kavre District were bussed to Dolalghat, Koshi Pahri for a fun-filled day. Nagarhope Basic School, our flagship project has grown from strength to strength since opening its doors in April 2014. From December 2016 to May 2017, 5 classrooms were constructed, a 2-roomed iron truss frame building with an activity hall / library, and a three roomed reinforced stone building that includes a computer lab. Our own school, and the encouraging fact that 65 students now attend classes there, has become our main priority. Our focus is not only providing as best an education as we can, but doing so by incorporating extracurricular activities such as computer, art, sport, story time, library sessions, morning yoga and exercises. As part of our school fundraising initiative, a group of cyclists will attempt a 1170 kilometre sponsored cycle from east to west Nepal commencing in January 2018. Things in Nepal have certainly changed over the years, though many constants remain. The political situation ebbs and flows endlessly creating history as it goes. We, as an organisation, change with the tides, but still hold dear to our original philosophy of providing education, uplifting the downtrodden and working with local communities to achieve our goals. Sodha Gurung, a student we helped through school and then nursing college, has qualified as both a nurse and a policewoman, now working in the police hospital in Kathmandu. She is providing for both herself and her family as a result of the assistance we were able to provide her. Another constant has been the support that allows us to function and assist those in need. 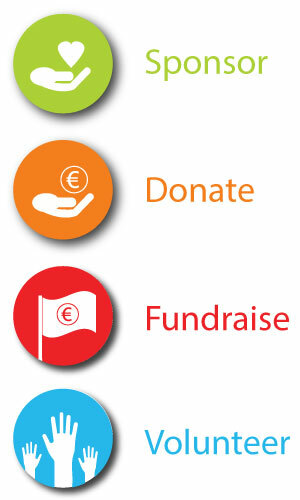 Our sponsors, donors & well-wishers enable us to continue assisting people on the ground in whichever way we can. My humble thanks, once again to each and every one of you for your continued support.